Do Hallmarks always mean it's silver? I just picked up some forks because they had hallmarks. I’m sure any hallmarked item doesn’t denote the content could be silver, but how can I tell the difference? Here are 3 different types here and I can’t figure them out. There are no English Marks. American marks, sometimes, spell out the names as opposed to initials. The forks are old and the stamping is well pronounced. What do these marks mean? The marks you have photgraphed are actually old Victorian silver plate marks, for William Hutton & Sons, The mark was used around 1849, so that gives you a good idea of age. It is sometimes very hard to tell if something is solid silver, espeically when alot of old plate carries pseudo marks that look very similar to hallmarks. In England the only mark you need to look for is the lion passant mark, (actually this isn’t quite true, as the lion rampant is used for Scottish silver, and the lions head erased is found on Brittania standard silver). 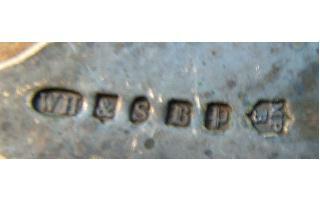 Anyway, as long as one of these marks is present then you can be pretty sure it is English solid silver. American silver usually carries the word Sterling on it.